A Chinese shipping firm is planning the country’s first commercial voyage through the Northern Sea Route, summer 2013. By 2020 as much as 15 percent of the country’s international trade can be shipped through the Arctic, reports the Barents Observer. 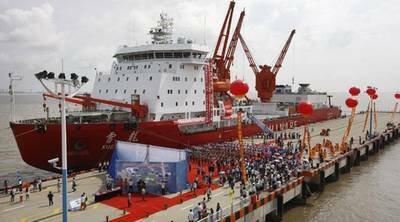 With melting icecaps accelerating the opening of new shipping routes and the exploration of oil, gas and mineral deposits in the Arctic, China has been eager to gain a foothold in the region. In 2012 the icebreaker Xue Long (Snow Dragon) became the first Chinese vessel to sail all along the Northern Sea Route into the Barents Sea and upon return sailing a straight line from Iceland to the Bering Strait via the North Pole. For China, the route would save time and money. The distance from Shanghai to Hamburg is 5,200 kilometers shorter via the Arctic than via the Suez Canal.